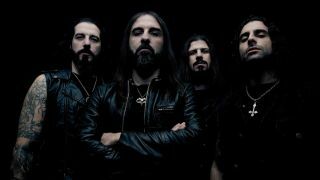 Rotting Christ will temporarily change their name to appease religious protesters in South Africa. The band are lined up to play in Johannesburg on July 1 and Cape Town the following night, but will have to appear under an assumed name. The shows have been arranged by Witchdoctor Productions, the firm behind the country’s Witchfest event which, last year, was also the target of protests. Those opposed to the Rotting Christ shows are also up in arms over Behemoth gigs scheduled for Johannesburg on March 26 and Cape Town on March 27. In an interview set to be broadcast on TeamRock Radio’s Republic Of Rock show this Sunday, March 13, promoter Shaughn Pieterse says: “What we’re going through is what the metal scene dealt with in the late 80s and early 90s, with religious folks challenging them and trying to stop the shows because they disagreed with the opinions and messages of the bands. “It started early last year with Witchfest 2015. In order to host an event you’ve got to get certain certificates from the council. Every time we made a move to do everything by the book, the councils were getting shot down by so-called Christians and religious protesters. “Every time we had to move venue we lost the deposit and you keep haemorrhaging money. But you have to make the show happen because if you don’t then they’ve won. You have to take quite a knock to show that they can’t stop you. While he’s disappointed to have to ask Rotting Christ to play ‘in disguise,’ Pieterse says the alternative was letting the protestors win. He adds: “I believe we live in a democratic society and art is art. You can’t censor it. Art is designed to provoke emotions from people. Once you start getting offended by art and start censoring it, where does it end? There is no word yet about what name Rotting Christ will take for the South Africa dates. Behemoth were kicked out of Russia in 2014 after objections on religious grounds.